From giant water slides in Bristol to giant crystals in Mexico, join us in the countdown of this week's bizarre and amazing photos. 1. 15. 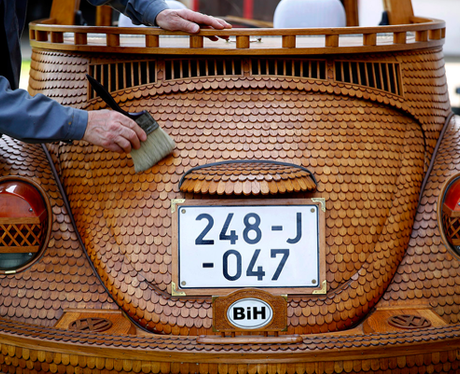 Kicking off our countdown it's this Volkswagen Beetle, created out of 50,000 bits of oak wood. 2. 14. In 14th place it's this bizarre Mammatus cloud formulation in Canada. 3. 13. Stephen Emerson captures the sun setting between the rock cliffs of Mullaghmore Gorge, Ireland. 4. 12. At number 12, it's this amazing giant slide on Park Street in Bristol. 100,000 people registered for the chance to take their turn to slip and slide through the British city. 5. 11. This man shows us just how much fun the Bristol Slide is! 6. 10. In 10th place, we've finally found somewhere to store all our top secret documents. 8. 8. Taking 8th place it's this hilarious picture of a seagull sitting on a glass roof. 10. 6. 'The Lion King' themed graffiti can't help but put a smile on our face. 11. 5. We love the contrast of old and new ways of harnessing the same natural element. 12. 4. Just missing out on a medal this week it's this poisonous-looking electric blue mushroom. 13. 3. There's no denying Reddit user Luke Allen's phenomenal artistic talent! 14. 2. This photo of a man dawrfed by a giant piece of driftwood scoops this week's silver medal. 15. 1. This week's gold medal goes to this incredible photo of the Cave of the Crystals in Mexico. Wow!